Supply and demand are quite commonplace concepts in the media. Securing a supply of oil or electricity that will meet demand is one justification given by politicians for proposed pipelines and nuclear reactors. Addressing the carbon footprint of personal car use is linked by journalists and activists to a reduction in demand and a shift to travel by bus, bike, or foot. Yet the familiarity of these types of discussions often hides the gaps in our knowledge. In the DEMAND (Dynamics of energy, mobility and demand) Centre, funded by the EPSRC, I am part of a large team looking at a few of these gaps – in particular, how we can better understand dynamics of demand and how it is that people end up using energy and various transportation modes and services as a part of their everyday lives. We’re interested in thinking about what energy (including that related to travel) is for, and how focusing on the practices that use energy can offer new possibilities for addressing everything from climate change to supply challenges. Within the centre, my focus is on three projects related to the dynamics of energy use in everyday life, adapting infrastructures for a lower carbon society, and the integration and application project, which includes everything from conducting new research to producing soundbites, public engagement and policy collaborations. Many resources on our website, including the many people working in the centre, publications, and even recipes from our meetings. You can also follow us on Twitter. The DEMAND research centre is one of six ‘End Use Energy Demand’ Centres funded as part of the Research Councils UK Energy Programme. DEMAND also receives support from ECLEER (EDF R&D), Transport for London and the International Energy Agency – more on the DEMAND website. Hui, A. (2014). ‘[≠] manifesto‘, Demanding ideas: where theories of practice might go next, DEMAND Centre Working Paper 4. This was one of several short ‘manifestos’ presented to stimulate discussion about the ‘unfinished work’ in theories of practice. For the launch of The Nexus of Practices, I moderated a tweetchat on how practice theories are being used in research and how they might be developed in future. More can be seen on our website. Short articles I wrote with colleagues on the links between education policy and energy policy and how rhetoric of ‘keeping the lights on’ obscures other important energy issues can be found on The Conversation UK. I am also involved in producing a series of soundbites featuring the academics in our centre and how their research contributes new perspectives on energy demand. You can listen in on the DEMAND Centre Soundcloud page. 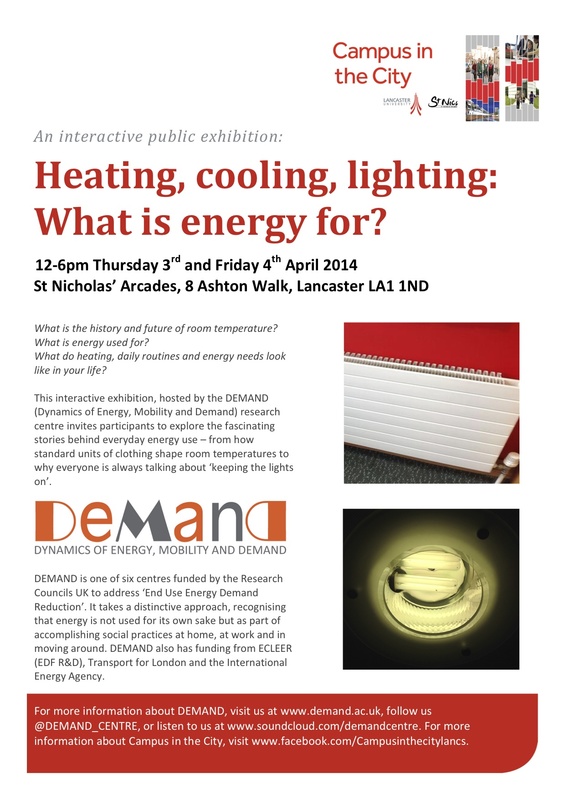 I have also produced an interactive public exhibition featuring work from DEMAND, held in Lancaster City Centre as part of Lancaster University’s ‘Campus in the City’ programme, 3-4 April 2014. Hui, A. (2017) ‘Sequencing multiple practices: What comes first, what comes next and implications for utopian thinking’, Mobile Utopias Conference, Lancaster, UK (4 Nov). Hui, A. (2015) ‘Sequences, services, and spaces of energy use: using theories of practice to move beyond segmented understandings of energy demand’, European Sociological Association Conference, Prague, Czech Republic (25-28 Aug). Hui, A. (2015) ‘Prefiguring futures: conceptual limitations and electric vehicles consumption’, Association of American Geographers Annual Conference, Chicago, USA (21 Apr). Hui, A. (2014) ‘Tracing networks and practices: electric vehicles in discourse and use’, Workshop on Climate change in the media and everyday life: a UK-Taiwan comparison of energy use and its media representation, National Chengchi University, Taiwan (21 Nov). Hui, A. (2014) ‘Infrastructures, technologies, practices: the challenge of productive ambiguities’, invited presentation at the Graduate Institute of Humanities in Medicine, Taipei Medical University, Taiwan (18 Nov). Hui, A. (2014) ‘Ambiguous objects, ambiguous practices: what is an electric vehicle?’, End Use Energy Demand Centres Transport Day, Oxford University, UK (16 Oct). Hui, A. (2014). ‘[≠] manifesto’, Demanding ideas: where theories of practice might go next, Windermere, UK (18 June). Hui, A. (2014). ‘Intersections of mobilities, practices, and futures’, Mobilities and Design Workshop, Centre for Mobilities Research, Lancaster University, UK (30 April).